It wasn’t the most prolific year ever, but we’re still here… Happy New Year! Poking around here for the first time in a while…appears that the below link to the Marine Corps Gazette website is not as functional as it was a year ago when I posted this. Posting has been, how shall we say, a tad light in these parts for quite some time, but here’s an easy one: I’ve got a piece in the current edition of the Marine Corps Gazette, actually my submission for this year’s Major General Harold W. Chase Prize Essay Contest. In it I propose that the Marine Corps should start a ‘China Hands’ program modeled loosely off the existing Afghanistan-Pakistan Hands (APH) Program currently administered by the Department of Defense. They should do it now, to get out in front of emerging needs down the road, as opposed to APH, which was only created close to a decade after the U.S. war in South Asia began. Read the article, linked above, and let me know what you think. Some may find this interesting: the ‘China Hands’ idea was actually going to be my submission for last year’s (2012) Chase Prize Essay Contest, but I didn’t get it submitted before the deadline. This year, I still wanted to use the same idea, so I dusted it off, revised it and made a few tweaks, and sent it in. W I N N E R ! So if that model holds for me and my idea for next year’s contest (I already have the winning idea in my head! ), I’ll run out of time writing that one up for 2014, sit on it for a year, then submit it for the 2015 contest and take top honors. Anyone willing to make a wager on this? Me either…I probably should just get my current idea written up and ready for the 2014 contest. I’m going to be participating in this year’s midshipman-run foreign affairs conference at the U.S, Naval Academy from 10-12 April as a senior advisor to the “Cultural Landscapes” roundtable. I’m excited to visit Annapolis, as that I’ve never actually been to the Academy. I am quite certain that the midshipmen and civilian delegates there will live up to the high standard set by their Air Force brethren at the Academy Assembly last fall (see my previous post for more details on that). Beyond that, there are some serious heavy-hitters in the foreign policy arena making appearances at NAFAC this year, including Secretary of State Hillary Clinton and former U.S. Ambassador to China Jon Huntsman. The academic lineup is none too shabby either, featuring Robert Kagan, G. John Ikenberry, and John Nagl. Former Deputy Secretary of Defense Paul Wolfowitz and Ambassador Paula Dobrianski will also make appearances during the proceedings. I’ll have more here about the conference after it actually happens, but in the meantime, check out the conference website at http://www.usna.edu/NAFAC/index.html. 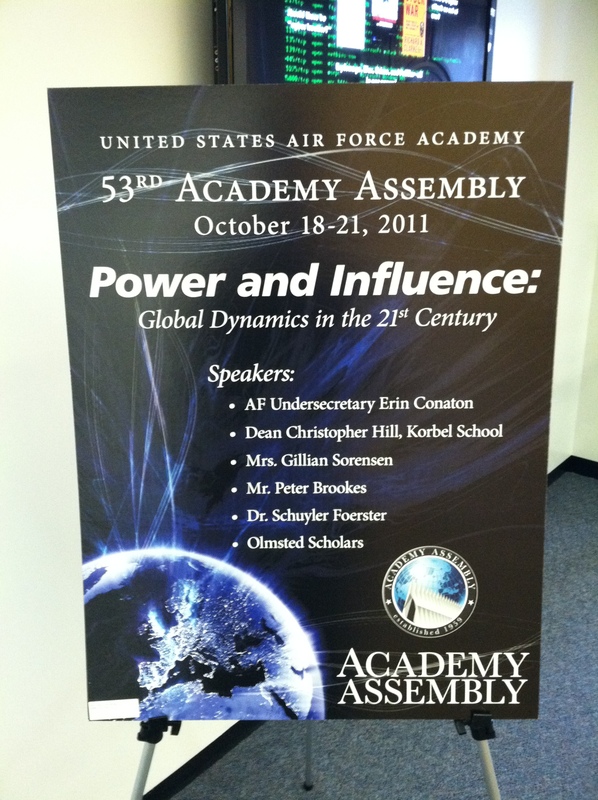 In October 2011, I had the opportunity to go down the road to the U.S. Air Force Academy (USAFA) in Colorado Springs and participate in their annual foreign affairs conference, called the Academy Assembly. 2011 marked the 53rd running of the event, and in the past it has featured speakers and participants from the likes of Paul H. Nitze (1959) to Donald Rumsfeld (representing the Office of Economic Opportunity in 1970) to John Nagl (2009). It was a great experience, not only professionally, in what really was my first opportunity to interact with some really bright cadets and also undergraduate students from various public and private universities across the U.S. who were delegates of their schools to the Assembly, but also personally, in that I had never really been any of our nation’s military academies before. While I was there I had a chance to tour the famous chapel (see a few of the photos I took at the chapel below (along with some other photos from the week) – really beautiful! ), take a meal with the cadets (all 3,000 of them! ), and stroll the grounds of what really is a fantastic location, situated hard against the front range of the Rocky Mountains overlooking Colorado Springs. I came away from the experience really impressed by the caliber of cadets at the Air Force Academy and hoping that I have a chance to visit again soon! My official duties at the Academy Assembly were threefold: first, moderate the discussions of the several cadets and civilian delegates assigned to my roundtable. I believe there were about ten of us, in total, including me and the cadet who was assigned to guide me around the campus during the week I was there, Cadet Second Class Andrew Gallion. After each major event/speaker during that week, we convened a roundtable to discuss what we had just heard attempt to tie it in with the overall Assembly theme, “Power and Influence: Global Dynamics in the 21st Century.” Speakers at this year’s assembly (bios here) included Mrs. Gillian Sorensen, United Nations Foundation Senior Advisor and National Advocate; several Olmsted Scholars (include myself; more on this aspect below); Undersecretary of the Air Force Erin Conaton; Mr. Peter Brookes, Senior Fellow for National Security Affairs at the Heritage Foundation; USAFA’s own Dr. Schuyler Foerster, Brent Scowcroft Professor of National Security Affairs at the U.S. Air Force Academy (I liked his presentation the best of all the week’s presentations – it was candid and realistic), and finally, Ambassador Christopher Hill, currently Dean of the Josef Korbel School of International Studies at the University of Denver (and previously U.S. Ambassador to Macedonia, Poland, South Korea, and Iraq, as well as Assistant Secretary of State for East Asia and Pacific Affairs from 2005 – 2009). All the roundtable discussions augured towards a final deliverable: a set of “findings” that distilled each small group’s several hours of discussion and debate on the issues presented into a short document complete with conclusions and recommendations. The second thing was to participate in a special panel featuring all the Olmsted Scholars who came to the Assembly, which in 2011 totaled six (there were originally supposed to be seven of us, but one scholar had to cancel at the last minute). This was an inordinately high number of scholars, according to the scuttlebutt floating around the Assembly, so the organizers decided to devote an entire panel to our insights. We each had a chance to speak for a few minutes about some of the major issues facing our nation/region of study, and after everyone had a chance to speak, the floor was opened to the cadets and delegates for questions. By the miracles of modern technology, I have obtained for you a chance to watch the Olmsted panel in full, which runs about 1 hour and 6 minutes. There are some pretty interesting perspectives shared by the various Scholars on Turkey, China (x2), France, Russia, and, of course, Taiwan. The final role of Olmsted Scholars at the Academy Assembly is just to interact with the cadets and delegates, and for the cadets in particular, be a resource for them regarding the Olmsted Scholar Program and service as a military officer in general. (Full disclosure: the Olmsted Foundation is one of the primary donors which fund the Academy Assembly each year.) This was perhaps the easiest role to fill – after all, it’s pretty simple to convey the sheer awesomeness of the opportunity available to young military officers to spend 3 years studying the language and culture of their country of choice, spending at least 2 of those years overseas and essentially “own your own program” to pursue a master’s degree and advanced language and cultural studies. The Olmsted Scholar Program is pretty well-known amongst the U.S. Air Force Officer corps, and, from what I saw at the Academy, also amongst cadets. Obviously, part of the reason past Olmsted Scholars such as myself are invited to these conferences (similar events are held annually at both the U.S. Military Academy and the U.S. Naval Academy) is to help spread the word about scholarship to cadets who in a few short years will be in the eligibility window for the program. Finally, the 28 October 2011 edition of Academy Spirit, the official newspaper of the U.S. Air Force Academy, carried a two-page spread about the 53rd Academy Assembly. You can see it here (html), or, if you prefer to read a “broadsheet” format, check out pages 8-9 here (PDF). Bonus: on the final day of the Assembly, I had the opportunity to see the entire USAFA Cadet Wing put on a parade in honor of General Peter Pace, USMC (Ret. 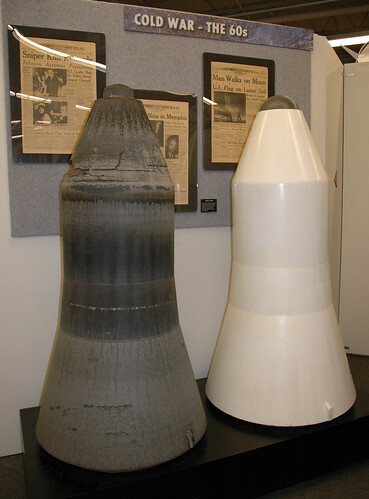 ), who was being honored with the 2010 Thomas D. White National Defense Award, the highest honor the Academy can bestow. You can see some of the photos from that event here. I bet there will be no shortage of Marine volunteers for duty Down Under! I’ve been to Darwin; I’d go back if the opportunity came up. UP to 2500 US Marines will be stationed in Australia for six months of every year under a new bilateral defence deal sealed today by Julia Gillard and Barack Obama today. The agreement will also allow more US ships and military aircraft – including B52 bombers – to operate from Australian bases. President Obama said the agreement, coming at the 60th anniversary of the ANZUS alliance, reflected the United States’ determination to safeguard security in the Asia-Pacific. ”Because of these initiatives that are the result of our countries working very closely together as partners, we are going to be in a position to more effectively strengthen the security of both our nations and this region,” Mr Obama said after private talks with Ms Gillard today. The agreement is set against the background of growing Chinese military spending and the dramatic expansion of the Chinese navy. Mr Obama said President Obama said the US welcomed the rise of China but “it’s important for them to play by the rules of the road”. Putting 2,500 U.S. Marines in the Darwin area is significant. It’s farther afield from China than is Guam, but still close enough to be “in the neighborhood.” Think of this as a “diversification” of the American defense portfolio in the region. While 2,500 Marines might not sound like a whole heck of a lot, numbers-wise, it is roughly equivalent to the number of Marines found in a Marine Expeditionary Unit (MEU), which are employed to such great effect off of U.S. Navy amphibious shipping assets around the globe. I would imagine that if these Marines based in Australia were to be employed operationally in the region, it would be in a MEU-like capacity, meaning that the modular expansion to a Marine Expeditionary Brigade (MEB) or Marine Expeditionary Force (MEF) would also be possible based on the size of the contingency. My apologies for such a long absence from this forum…it’s been a busy second half of the year. “…This year also marked several milestones for China’s decades-long military modernization efforts, fueled in part by a defense budget that has averaged 12 percent growth over the past decade. China has recently achieved several military “firsts”: it flight tested its first stealth fighter, conducted a sea trial of its first aircraft carrier, and made progress towards deploying the world’s first anti-ship ballistic missile. While all nations have the right to develop the means to defend themselves, the Commission continues to be concerned with the opacity of China’s military development and intentions, which invites misunderstanding. And, in particular, our report notes China’s development of its cyber capabilities, focusing on the growing evidence that Beijing sponsors or condones computer network intrusions against foreign commercial and government targets. When combined with the military’s excessive focus on other disruptive military capabilities, such as counterspace operations, it presents an image of Chinese intentions that diverges significantly from Beijing’s official policy of peaceful development. As a result of China’s growing economic and military strength, Beijing increasingly acts with greater assertiveness on the international stage. In the South China Sea, for example, Beijing insists on treating a multilateral maritime dispute as a series of individual bilateral issues, much to the consternation of the other claimants. Furthermore, newly acquired maritime security capabilities provide China with a means for backing up its excessive territorial claims in the region. Over the past year, China repeatedly asserted its interests by harassing Indian, Philippine and Vietnamese fishing and oil exploration vessels in the South China Sea. The willingness to place Chinese national interests ahead of regional and global stability is also demonstrated in Beijing’s relations with both North Korea and Iran.